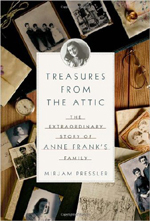 Chronicled by Buddy’s wife, Gertrude, and renowned German author Mirjam Pressler, these findings weave an indelible, engaging, and endearing portrait of the family that shaped Anne Frank. They wrote to one another voluminously; recounted summer holidays, and wrote about love and hardships. They reassured one another during the terrible years and waited anxiously for news after the war had ended. Through these letters, they rejoiced in new life, and honored the memories of those they lost. Anne’s family believed themselves to ordinary members of Germany’s bourgeoisie. That they were wrong is part of history, and we celebrate them here with this extraordinary account.